The packages in the distribution have a proven track record of being portable across many Unix and Windows platforms. You can write applications which use the packages on Windows and then run them on Unix platforms without change due to the consistent platform independent interfaces. We are using the included packages on a daily basis in custom projects, on our own servers and for client installations. 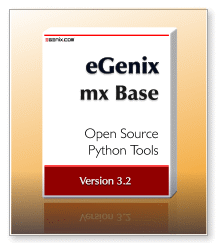 Many large corporations are building their Python applications on parts of the eGenix.com mx Base Distribution. It is also included in popular Linux distributions, such as RedHat, OpenSUSE, Debian, Ubuntu, etc. It includes a Python-programmable very fast state machine, the Tagging Ending, specifically designed for pattern matching and written in highly optimized C for both Unicode and char/byte strings. The package also include a number of helpful smaller modules in the mx.Misc subpackage, such as mx.Misc.ConfigFile for config file parsing or mx.Misc.CommandLine to quickly write command line applications in Python. Please refer to the source code of these modules for documentation. Please note that you will need a C compiler for this type of installation to work, in case our new web installer cannot find a suitable prebuilt binary. for UCS4 builds of Python (most Linux and FreeBSD distributions). Installation of eGenix mx Base is straight forward, since no additional configuration or dependencies have to be taken into account.